Cooltron specializes in providing cooling products and services to a wide range of industries. Cooltron’s popular cooling products are tube-axial industrial cooling fans, blowers, fan accessories, and heat-sinks. They also offer value added services like twisting lead wires, adding connectors, making fan trays and thermal engineering designing and testing. 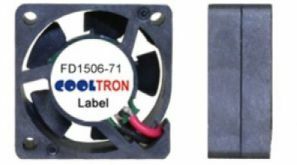 Cooltron’s popular cooling products are tube-axial industrial cooling fans, blowers, fan accessories, and heat-sinks. Cooltron also offer our customers value added service like twisting lead wires, adding connectors, make fan trays and thermal engineering designing and testing. Cooltron’s new high performance DC fans feature a reinforced core structure with metal tubes. Designed especially for high end applications such as cloud servers, these fans deliver a much higher airflow and static pressure than a standard DC fan of equal size. This new performance line is available in various case sizes with 12, 24 or 48 Voltages.